There are a few ways to get a start at woodworking. One way would be to pick a number of small projects, gain some experience and confidence as a woodworker; then slowly graduate to more complex work. The opposite of this would be to pick a monster project and just go at it. Determined to pull it off, sticking with it until success becomes real. I know a thing or two about monster projects. Take for example the renovation of our foyer which took three years to complete (my fault – I over-engineered it; a recent photo of it is here). Another ambitious project was the construction of a coffered ceiling in our living room. This was 100% overhead work with lots of parts to fit. I once said that any project which involves frequent ladder work is automatically no fun. So it was with surprise that I got an email from Holly showing me photos of her coffered ceiling projects. Why surprise? I think I lost count of the number of rooms she has added a coffered ceiling to. If I counted correctly, she added five coffered ceilings to her home. Five rooms; five coffered ceilings and she is a beginning woodworker. Thats right, bold and italic font – that is how impressive this is. New woodworker, monster project, and she did a fantastic job. “Hi Jeff! I stumbled upon your blog last summer while researching how to build a coffered ceiling in my basement. I wanted to replace the existing suspended ceiling grid and acoustic tiles and figured surely I could make something myself and use the grid like “studs”. 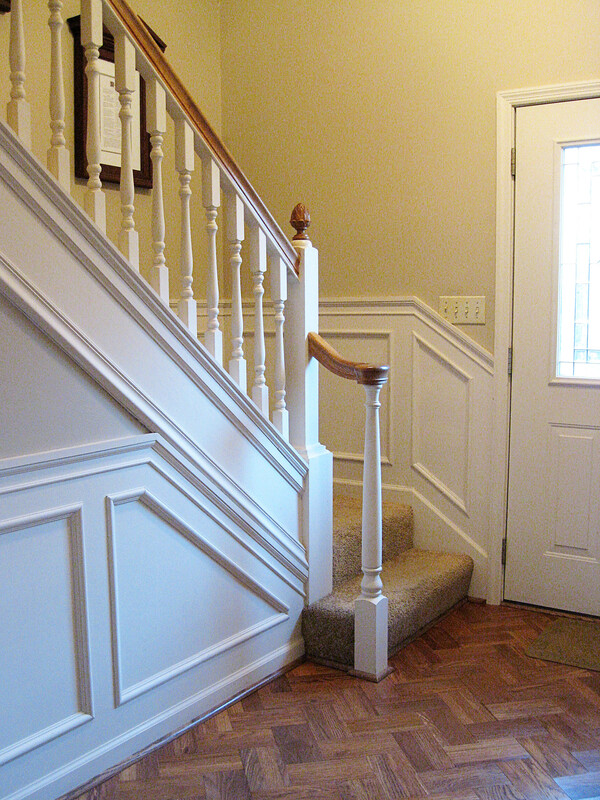 In any case, I looked at the plans that you did in your home and got lots of great ideas. If you can believe, I’m almost done. I have one more room to go and its the first room you enter as you walk in so I want the joinery to be as perfect as it can be. I’m a total novice and have had to purchase every basic tool there is because we had no woodworking tools. I know I could spend lots more money on tools, but now I’m almost done. Holly, I think by now you know my opinion – AWESOME! We traded a few emails and I got a better idea of her extensive work. 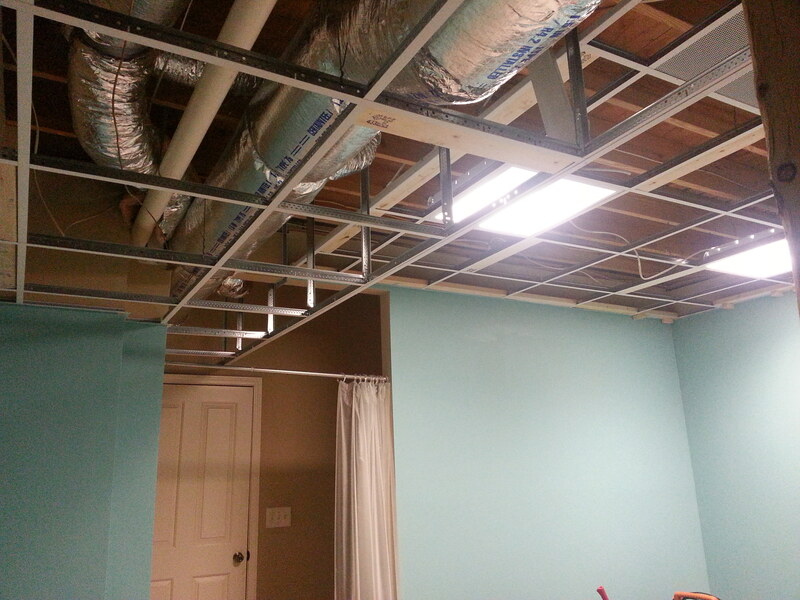 She added a coffered ceiling to her basement bedroom closet, moved on to the basement bedroom itself. Next was the bedroom bath and then she re-worked the bedroom closet. 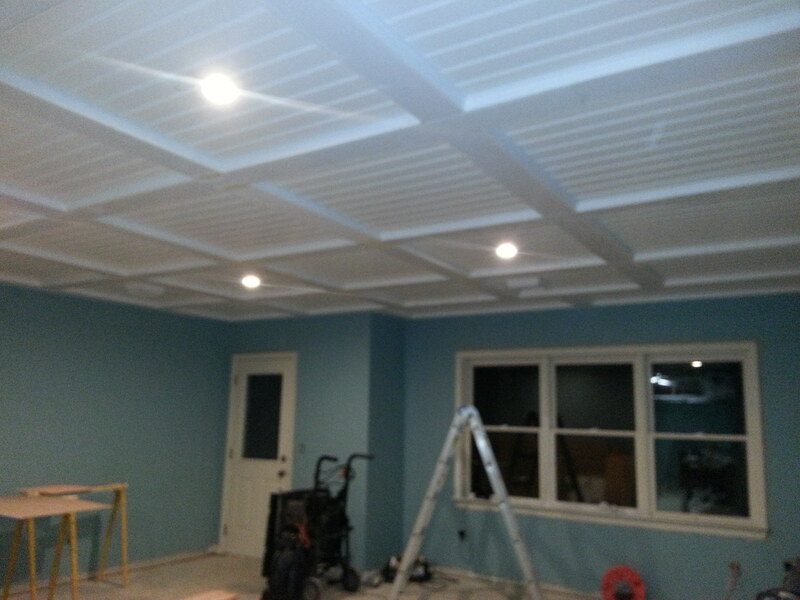 Holly just completed the living room ceiling and has another room to add a coffered ceiling as well. Sounds like she will be a coffered ceiling ninja when she finishes working in her home. Me: Your coffered ceiling looks awesome. Completing a project like this is a big undertaking. What was the most challenging part of construction? Holly: As a novice, I had no idea that walls aren’t straight, corners aren’t always 90 degrees, the ceiling grid I left in place because it was already level wasn’t necessarily level everywhere. So getting around those humps was one of many challenges I faced but likely the biggest. Me: What tools did you use while building the ceiling? Holly: Since I altered the process used going from room to room, I’ll just describe what I did initially for the bedroom. Miter saw to cut beams, drip molding and final trim. 18 gauge pneumatic nail gun to build panels. 16 gauge cordless nail gun to affix panels to grid. small electric corded sander to smooth joints. Me: It is rare to find two rooms the same size in a home. 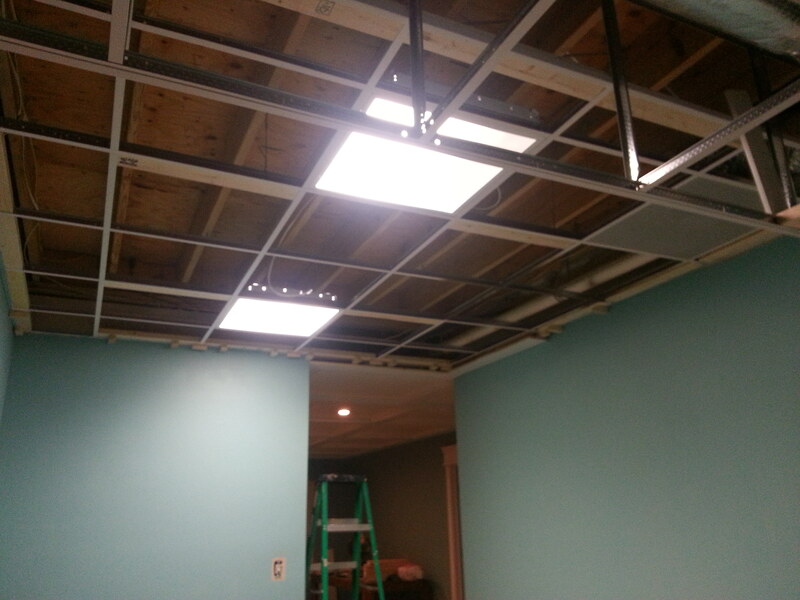 Did you have much trouble laying out the beams in your coffered ceiling? Holly: The bedroom is rectangular, so that was pretty straightforward. I chose a layout that visually I liked, then I started doing the math using the beam width as the constant and adjusting the beadboard size to fit the space left. Me: What was the most rewarding part of your project? Holly: Stepping back and looking up to see that it turned out exactly how I envisioned, as well as reflecting on everything I learned during the process. Holly has started a blog called “DIY Girl Cave” – check it out by clicking here. 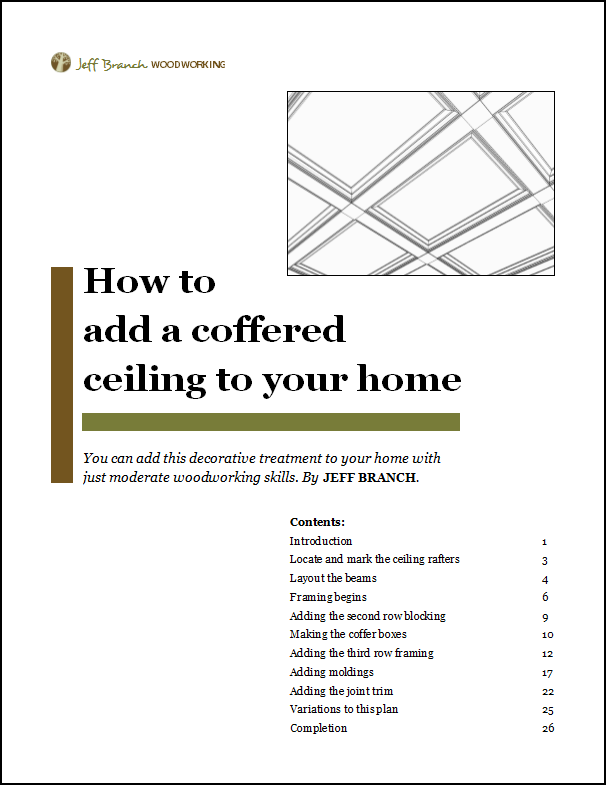 The woodworking plan Holly mentions is my very first plan titled How to Add a Coffered Ceiling to Your Home. Since very few rooms are the same size and shape, this plan serves as a framework for building a coffered ceiling. 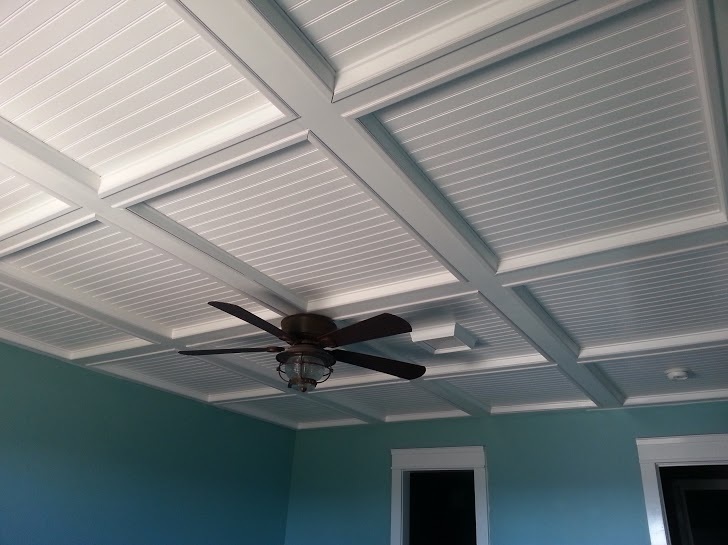 I go over the construction details on how I built a coffered ceiling in my home, list the tools used – even how to adjust the spacing of coffers to fit your home. This is my most extensive plan; 27 pages in length. As with all my plans, this one is available as a free, instant download. To get more information, you can visit the plan plage by clicking here. 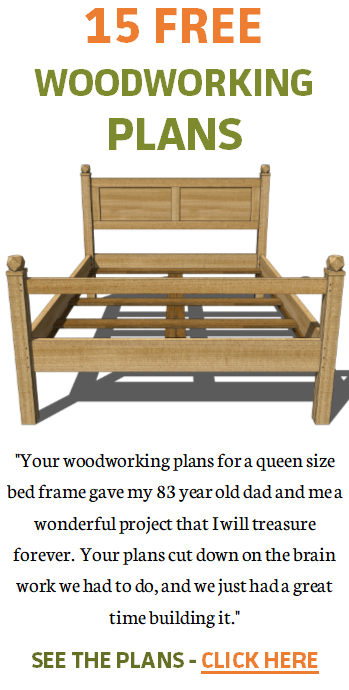 This blog post is part of Tom Iovino’s Get Woodworking Week initiative. Get Woodworking Week highlights projects by new woodworkers in hopes others will join the craft. Finally took the time to read your tutorial on coffered ceilings. The document itself, let alone the actual ceiling, is amazing. I think you have missed your calling as a teacher. While I am now inspired to try a similar project my aching back is reminding me that it doesn’t share my interest. To cut down on the tremendous amount of piece-by-piece overhead installation do you see any reason why some of the beam construction could not be done on the floor then lifted into place and secured, assuming you have a helper? Of course this raises the chance of making a monumental measuring error, but isn’t that why painters caulk was invented? Keep the various project updates coming. I really enjoy them. And DIYGirlCave your finished product rivals Jeff’s. Nice work! There are a number of ways to go about a ceiling such as this. A Google search will return web pages with a number of videos and articles; most of them approach such a project differently. I did it this way because I did not have a helper and I knew there would be mistakes. I definitely think you could create this ceiling with larger sub-assemblies, especially if there are precautions taken to compensate for any unforeseen issues like a wall having a bump in it. And having a helper makes lifting larger assemblies possible. I say you should go for it. Thanks for your comment. WOW Holly….that ceiling is AmaZing!! 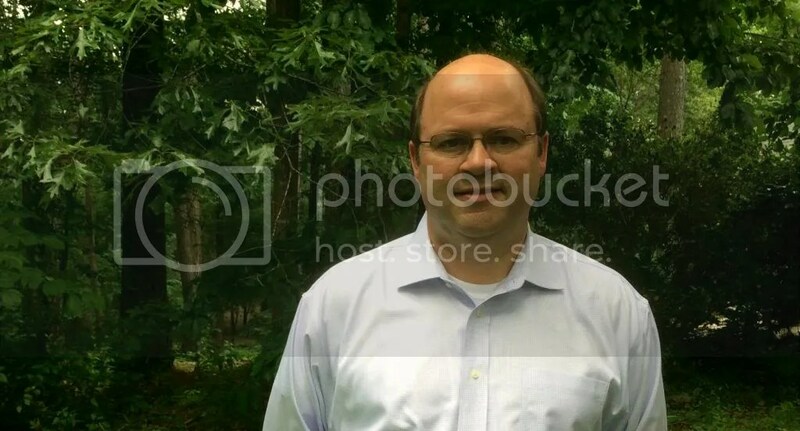 I really enjoy your blog Jeff. Wow that’s amazing, Holly! I enjoy your blog, Jeff! Would love to do some of these projects! Gorgeous! I absolutely love coffered ceilings and have had them incorporated into my own home. Wow, this is simply amazing! I don’t think I will ever get to woodworking projects as HUGE as this. I am still in the furniture revamp and tasks.